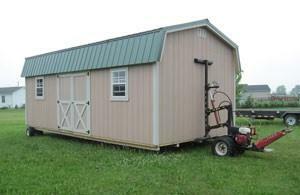 Most sheds under 12 feet wide are delivered prebuilt to your prepared site. In order to deliver your shed prebuilt, access space equal to the width of your shed is required. When access is available, buildings are unloaded off of our truck or trailer to your prepared site location. 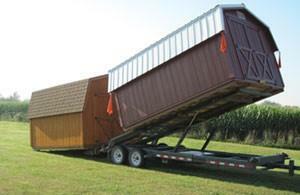 Our custom-built trailer allows us to position your building right where you want it! With our Mule delivery system, many buildings can be delivered prebuilt where it would be impossible otherwise. All that is needed is enough space for the building to fit through, (width and height). Flotation tires at each end of the building carry the weight, minimizing tracks in your yard. Tracks are similar to taking a large riding mower through your yard. If delivering prebuilt is not possible, our professional on site crew can assemble your building right on your lot. 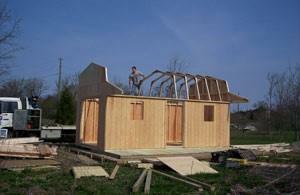 It will be prefabricated in our shop in panels, then assembled on your lot. Building time varies with different sized buildings but our crew can have an average-sized building ready to go in just a few hours. Larger buildings may take up to a day to complete.